Well-conditioned hair looks easier than it is, and that goes double for curly hair. Type 3 hair is unique in that it often does not hold its natural oils. Without natural oils, hair becomes dry, potentially leading to significant hair follicle damage. This leads to dry and unmanageable hair, spelling disaster for any curly girls out there. Even so, those who are new to the realm of wearing their curls naturally may be surprised to hear that there is a perfect set of conditioners made just for you. Conditioner is a hair care necessity, and it can simple be defined as one or more products applied to the hair for the purpose of adding moisture. However, conditioners can do so much more than hydrate. Conditioners can also lock in moisture and nutrients, preventing frizz, fly-a-ways and split ends. There are three distinct categories of conditioners. Crème rinses or a daily conditioners help in the hydration process and is light enough on the hair where it won’t weigh down the hair. 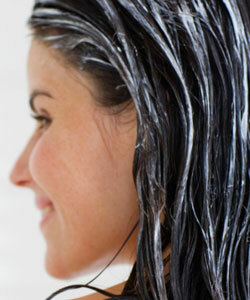 Leave-in conditioners have a similar job to a daily conditioner in that they hydrate and lock in nutrients. But unlike crème rinse, this conditioning treatment stays in your hair, locking in moisture for longer. Last on the list are deep conditioners. Deep conditioners are heavier on curly hair than the average conditioner and can weigh down your curls. If you’re having issues with your damaged hair, try a deep conditioner every couple of weeks. Your hair will soon regain that healthy sheen. One of the most important things you can for type 3 hair do is lock in moisture. The best way to achieve hydration is to find conditioners that contain certain kinds of oils. Shea butter and a variety of oils including coconut and olive oil are major pluses for your hair. Alongside the enhancement of oily nutrients, the conditioner should also have key words like “for curly hair,” “ultra moisturizing,” or “conditioning” and “anti-frizz formula” on the product label. Now that we’ve established the types of conditioners and the ingredients and labels to look for, it’s time to take a look at the best conditioner for you. For someone with type 3 hair, all kinds of conditioners are important. You want conditioners that curb frizz and help to prevent damaging environmental effects. You also want conditioners that lock in moisture without significantly weighing down hair. Co-washing or the condition-wash-condition method are highly recommended for type 3 curls. This helps develop and sustain the natural oils in your hair and scalp. The conditioners also work to weigh down the curls for a cleaner look, but won't cause frizz or fly-a-ways that can often occur from over-shampooing. If all else fails and your hair is falling short of your expectations, try the occasional deep conditioner. Type 3 curlies benefit most from deep conditioning treatments at least once a month up to once a week. When it comes to specific brands, a few stand out for those with curly hair everywhere. Curl Junkie, including their Beauticurls Strengthening Hair Conditioner, works wonders on detangling and frizz. For a deep conditioning treatment, try Carol’s Daughter Olive Oil Infusion Set. That’s a great option for locking in moisture and nutrients. DevaCurl, Infusium, and Tigi Catwalk are a few other notable brands with various daily, leave-in and deep conditioners.